The search began in about 1982 when I was browsing through a book store in my home town, Del Mar California, and I came across the volume shown below. This thin volume contained a collection of papers from a conference held in Soviet Armenia during 1971, edited by Carl Sagan. 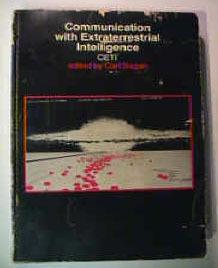 The books title is "Communication with Extraterrestrial Intelligence (CETI)". Notice that it is "Communications with ET" not "Search for ET" as we now now call it. The book was interesting reading and held papers by people who's names didn't have much meaning for me at the time. People like Philip Morrison and G. Cocconi, Frank Drake, Freeman Dyson, and Marvin Minsky. These were the same people who later became the focal point of my creation of the software and hardware for the first search. Drake went over his now famous "Drake's equation" and it was the first time that I had seen the water hole curve plotted out. Other subjects were the possibility of extra solar planetary systems, the evolution of civilizations and various techniques of contact with ET. Someplace in the book I read that "it is expected that advances in computer technology would increase the possibility of detection". Remember that in 1971 there were only a few large scale computers and not even a hint of computers for the average person. It dawned on me as I was reading this book, more than 10 years after it was written, that the age of personal computers was just about to happen and that I had one myself. This first computer didn't have a name but it filled up a good part of my home office and was about as capable as those university machines in use when the conference was held. "I may be the only one around that could actually build a machine to search for ET"
I was right - at that time I was the only one that could put it all together. Things have changed a lot since then but there is still only one amateur search station (this one). There are three or four professional SETI Stations in operation. First Computer- These are some shots of the first computer built by a single person that I know of (me). It may not actually be the first, but its the first that I know of. If anyone knows of an earlier one please contact me. This machine was built to learn about computers and because I met a guy who told me with the up-most assurance that a computer would never be built by a single person - it was simply too complex. At the time I was working at Link Singer building the first digital computer for a Link trainer. That computer was huge, it filled several racks of equipment, and was one of the very first built using integrated circuits. I remember that a dual flip-flop from Motorola cost $9.00. That machine itself was very interesting - but that's another story. All the hardware was scrounged from surplus yards or built from scratch. The chips were bought from a guy that made a living picking up discarded chips from Intel, Motorola, and Fairchild, testing them and reselling them. He also kited and sold one of the first computers concurrent with the IMSI. Below the shelf was a paper tape punch and below that a power supply control console. If you look closely at the table in the foreground holding the TTY you will see a copy of the first Byte magazine. I still have a complete set of the first year of Byte which makes for very interesting reading on a rainy day. When I finally got this beast running I used it to contact a second computer in downtown San Diego over a 300 baud modem (not shown). That machine had an assembler, written in Basic, for my machine. That way I could create a program on the distant machine, assemble it and download the result to run on my machine. The first piece of software I wrote was a relocating linking loader for my machine. With that I could fill up my 2K words of memory with what ever I needed. This is a picture of the inside of the machine showing some of the circuit cards I built and my trusty 'scope to keep it all running. Each card was built using 30 gage wire wrap wire. The card on the extender was a serial controller for the teletype. It had one of the first UARTs for the actual bit banging. The large white ribbon cables were used to interconnect the cards on the front side. On the back plane side they were wire wrapped using 26 gauge wire. The card on the left side, showing five integrated circuits, is the CPU. This card is the part of the computer still in existence and is shown below. CPU Card - The CPU card was built using SN74181 chips from Texas Instruments. This card has four of them in the middle of the board with support TTL around them. On the right side was a set of registers (16 of them) used to hold intermediate results from the '181s as they did their work. The chips on the left side were the bus buffers. The chips between the '181's were the high speed look ahead carry logic. This machine ran at a blazing 1 MHz clock rate but could do all the things that any modern machine could do (plus some that they don't). Each instruction was 16 bits wide and there were a total of 45 instructions. Each instruction could be either indexed or indirect or both. The instruction set was copied from a commercial mini-computer that I was using at work (Philco/Ford at the time). Memory for this machine was built from 1 K bit dynamic RAM and at the end I had four cards with 1K X 8 on each card or a total of 2 K of 16 bit memory. Since the chips were dynamic I had a refresh clock running at all times. Without that they would forget what they were programmed with. Booting this machine was a chore. I had to toggle in each of the 20 or so instructions through the front panel each time I started up. This boot strap program would load what ever program was in the paper tape reader. The program was the BBS software or the assembler or the loader or what ever I was working on at the time. I was able to get the machine to control my ham rig and send Radio Teletype signals (RTTY) using it. I was also able to build one of the very first bulletin board systems (BBS) in San Diego where the user would call into my home phone and the modem would answer and give the remote user complete control of my computer. I think this is the first time I started using the name Zeke for a computer. The BBS was named Zeke and was well known in this area. It used to tie up my home telephone for hours at a time. This was long before AOL was a dream in anyone's eye. Second Computer After I got the whole thing running and was able to link and load the first assembled program for the computer I broke out the wire cutters and cut the whole thing to pieces. It had served its purpose and besides I had a new toy to play with - Zeke was a Z80 machine that I built the first SETI search system on. Zeke was named after a computer like the one that Jerry Pournelle of Byte Magazine used and was always writing about. It was a Cromemco Z-80 machine with a large Z on the front. At that time this machine was hot stuff. It ran at a blazing 8 MHz and sported a monster 20 Meg hard drive. These things were anything but cheap by the way. The twin 8 inch floppy drives cost nearly $2,000 and the hard drive was $1,500 by itself. The computer was about $5,000 and it came as a kit - you had to build it your self. A 32 K byte RAM card cost about $500 dollars which was a bare board and a bag of parts. When I finished Zeke I had about $10,000 into it. It needed a job to do. I put Zeke to work on the SETI project. Antenna - I bought a 12 foot TVRO antenna and a Az/El positioner for it. The rotor was the only one that I could find that could manage the 12' dish for and steer in Az and El. Just the thing to follow a point in the sky while looking for ET. I bought a Low Noise Amplifier from Down East electronics, and a friend of mine that I met at a Society of Amateur Radio Astronomers ( SARA) Jeff Lichtman, had a friend who volunteered to build a feed horn for me. The whole thing was sort of impressive against the sky. Early Software - Turbo Pascal was used for the code that connected the antenna to my Yaesu ham receiver by way of a down converter and phase lock loop oscillator. I also wrote code that produced a 'waterfall' display of what the receiver was able to detect. This was a time before Windows so I had to learn how to build drop down menus and manage screen images. It was a very challenging task. The images that you see here are from photographs of Zeke's screen. The data itself is lost. Images - Some of the first pictures were of the 5 MHz band rather than the 1.42 GHz water hole that I was planning for. I did that because I knew what to expect at 5 MHz. The yellow band at the right side is the carrier of WWV which is centered at 5 MHz. As you can see the receiver says that WWV was drifting down band over the 6 hours it took to collect this much data. I know that WWV didn't drift down - what was happening was the my receiver was drifting up. I think that what was happening was that the Local Oscillator (the LO) of the Yaesu FT-757was drifting up band. several carriers that remained on full time. I think that all the signals were probable noise from the local system clocks and oscillators etc. This was not a very quiet system. Further development of the SETI system was stopped while I concentrated on raising a family and paying the bills. In 1999 I retired from SAIC and was able to put more effort into the new system called SETI Net.